Authors: Keith Bradby, James A Fitzsimons, Andrew Del Marco, Don A Driscoll, Euan G Ritchie, Jenny Lau, Corey JA Bradshaw and Richard J Hobbs. 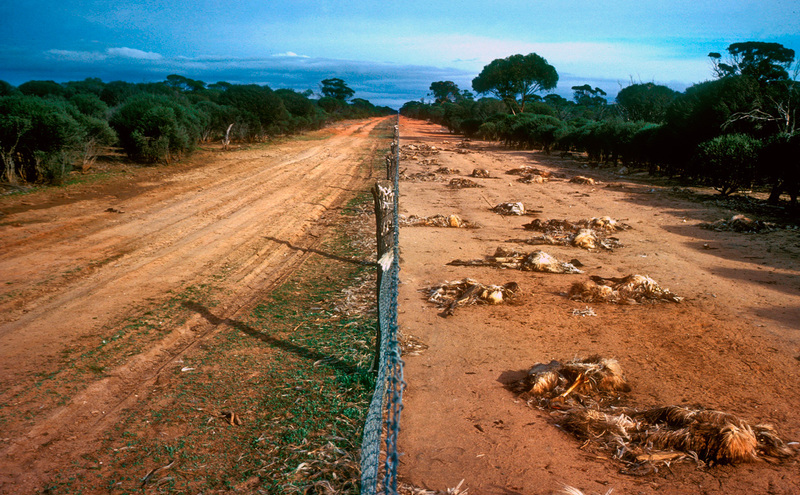 Western Australia’s State Barrier Fence represents a continuation of colonial era attitudes that considered kangaroos, emus and dingoes as vermin. Recent plans to upgrade and extend the Barrier Fence have shown little regard for ecological impacts or statutory environmental assessment processes. Emus are known to travel up to 1000 kilometres between seasons. This is what happens when their migration is impeded by the West Australian State Barrier Fence. Image credit : Graeme Chapman. This entry was posted in Publications and tagged barrier fences, corridors, dingo, ecological connectivity, Emu. Great Western Woodlands. on 22 September 2014 by Euan Ritchie. I saw a doctored emu photo, but your reply to comments and following photo made the truth clear. There is something very wrong with how we are using this land. Barrier fences are a symptom of fear of the unknown, colonial thinking. Working with the character if the country is the obvious direction agriculture and governments should take, not simply altering a landscape to suit a market need. Just imagine WA property boundaries being circular. No corner posts, less wire material, no 90 degree turns for ag machinery, same size allotments, free flow of biota between properties. Probably cheaper…time to tell surveyors we have Google Earth and gps.